Belize Private Island Rental Ideal for Intimate Beach Weddings! Dreaming of getting married on a beautiful, secluded private island with just your closest family and friends? Look no further than newlyweds Andrew and Ellie who rented the entire island and invited family and friends to witness them tying the knot! At Coco Plum Island Resort, our all inclusive private island rental package features fourteen oceanfront cabanas and a luxurious three-bedroom/three-bathroom private villa that is perfect for for a group of about thirty people. Andrew and Ellie brought 25 of their closest family and friends to enjoy the natural beauty of Belize and partake in the weeklong wedding festivities! Our luxury thatch-roof villa that sits atop the Caribbean Sea! The Caruthers wedding group spent a week enjoying life on their very own private island paradise where they were able to sunbathe along Coco Plum’s sandy beaches, as well as swim, kayak, paddle board, and hobie cat along the shores of the Caribbean Sea. Whose up for kayaking around the island? On some evenings, the group met up at the luxurious private villa for happy hour drinks and snacks served by our bartenders and spent time laughing and enjoying the intimacy of having the entire island to themselves. The Caruthers also wanted to explore a bit of the adventuresome side of Coco Plum – they took a five minute boat ride to the Great Belize Barrier Reef and did two snorkel trips to experience even more of Belize’s marine life! They also did the cave tubing & zip lining exploration tour in the Belize rainforest. On the day before the wedding, the group got to see one of Belize’s largest Mayan ruins, Xunantunich. It isn’t so bad being stranded on an exotic private island after all! The lovely bride and groom underneath the wedding arch overlooking the Caribbean Sea! The “Big Day” was an unforgettable one for Andrew and Ellie who loved having their closet family and friends be apart of their destination wedding. Even the Coco Plum staff was excited to prepare for the wedding ceremony: from hand-picking flowers for the wedding arch, to mixing cocktails and preparing the dinner feast for after the ceremony, the Coco Plum staff couldn’t be happier to be apart of the joyous occasion! The bride and groom were given a framed poem with words of love written by the Coco Plum management and staff. The intimate ceremony ended with dinner and drinks as well as dancing and music by a local Garifuna band! Here are some highlights from the wedding ceremony! Check out our TripAdvisor reviews for guest insight on their stay at Coco Plum! The perfect place for two people in love! Local Garifuna drummers join in on the wedding festivities! And the music keeps on playing! 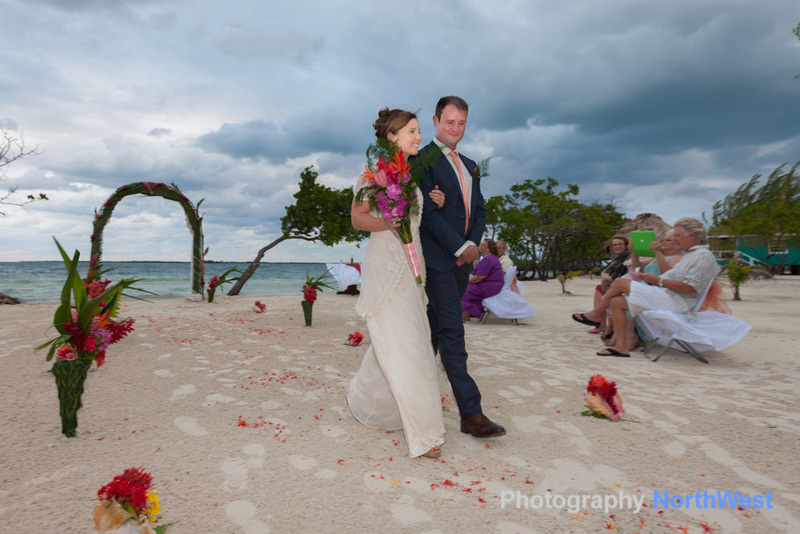 Thinking of getting married on a Belize private island? Call or Email us today!